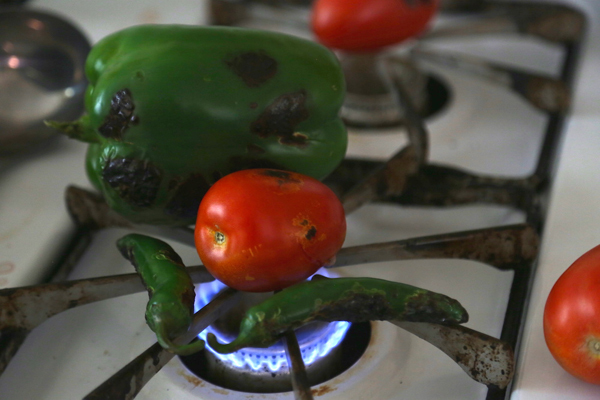 The first time I went to Tunisia when I was 19 years old, I remember watching my host mom in amazement as she nonchalantly plopped some green peppers, tomatoes, an onion, and a few cloves of garlic right on her stovetop burner. I had never seen anyone cook food directly on a burner like that before. As the vegetable skins began to sizzle and char, they released an intoxicating aroma into the house and before I had even tasted it, I was already smitten with this dish. Slata Mechouia is a staple in Tunisian cuisine. It translates from Arabic as “Grilled Salad” but it is really more of a grilled salsa than a salad. 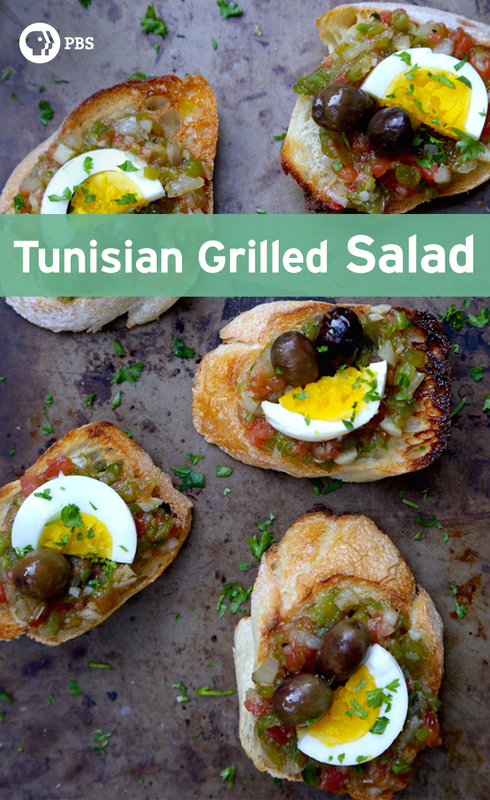 You’ll find it on just about every Ramadan dinner table in Tunisia, and since the month of Ramadan is soon coming a close, I thought it would be a good time to share this recipe with you. I’ve shared my love of Tunisian cuisine before, with video recipes for Tunisian Spinach Rice and also traditional Zrir dessert which is eaten to welcome the arrival of a new baby. And if you follow my blog, you might remember my friend Synda and I’s crazy baby adventure a couple years ago! Well, it was during that period that we filmed this Slata Mechouia video together, just a couple weeks before her little one came into the world. Synda is such a gifted cook. Everything she touches is imbued with the indescribably fragrant flavours of her country. Whenever we visit each other, I beg her to make Slata Mechouia. But since there is a long distance between us and our visits are precious few, I’ve had to learn to make it myself. 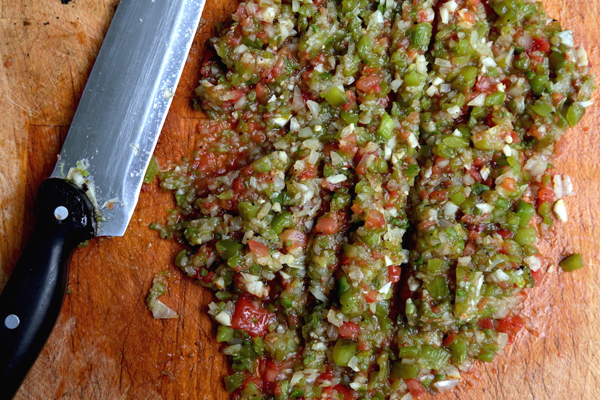 It’s hard to find the slender, deep green, slightly spicy peppers that are common in Tunisia. The ideal pepper for this recipe is dark green, mildly hot, long and slender, and deeply flavorful. I usually use whatever green peppers I can get my hands, sometimes combining green bell pepper with a couple jalapeños. Poblano peppers are great if you can get them. But any dark green pepper will do the trick. You can adjust the type and amount of peppers to the level of heat you want the dish to carry. I like a Slata Mechouia that has a bit of kick to it, but won’t burn the tastebuds so it can be enjoyed in generous amounts. In the video, we used the wrong type of tomato because that’s all we had. You should ideally use Roma tomatoes, or any kind of paste tomato. It will hold its shape better when grilled and has less juice and more flesh which is exactly what you want. 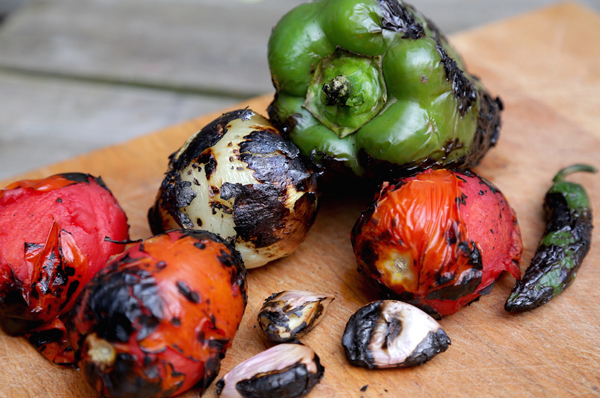 You can prepare the vegetables on an outdoor grill or roast them in the oven (Synda and I even experimented with roasting them on top of hot embers in a woodstove, which worked fairly well). But I love to do it directly on the stovetop because it reminds me of being in Tunisia. 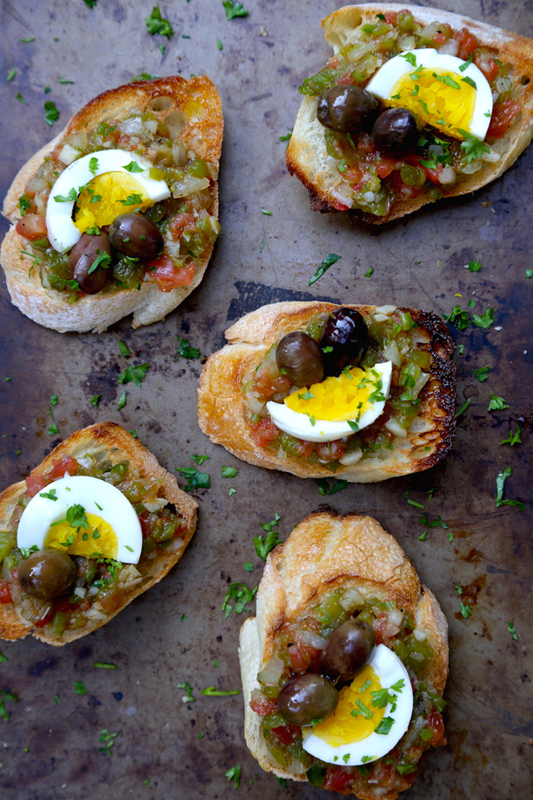 Slata Mechouia is generally served with an optional garnish of olives, flaked tuna, and chopped hardboiled eggs. It is usually scooped up by hand, with torn up pieces of fresh baguette. 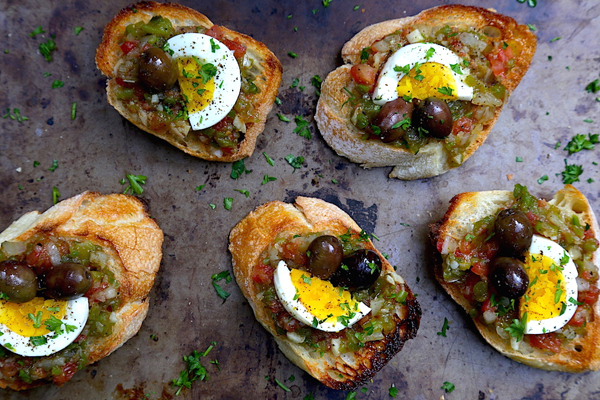 But for ease of serving, you can also spread it on toasted bread and place the garnishes on top. Do let me know what you think if you make this! Tunisian Grilled Salad is also known as Slata Mechouia featuring stovetop roasted peppers, onions, and tomatoes on baguette slices. Grill all the vegetables on a medium-hot grill, or in the oven (475 until lightly charred and softened), or directly over a burner. Grill until softened and skins are charred. Remove the vegetables from heat source and place directly in a tightly-lidded pot to make them “sweat” and for easy removal of the skins. Once cool enough to handle, remove all the skins as well as any seeds from tomatoes and peppers, and any charred flesh. (It’s ok for there to be the occasional charred bits, this will add flavor). Transfer to a bowl and add the ground caraway, salt, black pepper, and olive oil. Taste, and add more seasonings if needed. 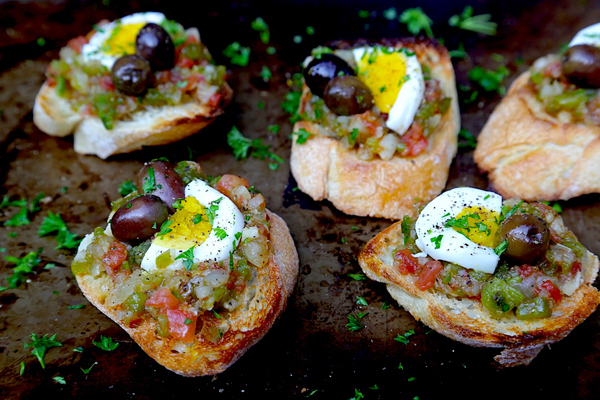 Top with the optional garnishes if you wish, and serve with a fresh or toasted baguette.